Isn’t crosswords one of the finest games to boost your brain skills while serving as a great stress buster and mood elevator? If you love online crosswords puzzles little too much, you would know this for sure. After all, you have been there and done that, right? Getting lost in the cryptic world of words and cracking those intriguing puzzles while brainstorming amidst those cues and clues is certainly the best way of rejuvenating and relaxing. In fact, it even induces you with instant gratification with all the word search puzzles you hit just on point. However, what if I say it could be a great motivating factor too? Not that it isn’t already motivating enough but, a little more of everything is always good, isn’t it? Well, if you are confused what am I talking about then, say hello to Wealth Words, a new age, contemporary online crosswords woven with love and creativity to give all the crossword aficionados an instant adrenaline rush! In fact, it won’t be wrong if I say that if you loved crosswords, you are going to love Wealth Words even more. And, why is that so? Curious to know what is so amazingly unique about this online crossword game? But, before that, are you willing to answer a small question of mine? Well, you might have played a lot of crosswords and won plenty of it too but, did you receive anything apart from gratification and few applauds from it? No, right? And, here’s where your answer lies about Wealth Words being an impeccably crafted online crossword puzzles because, this puzzle, my friend, gives you cash prizes as winnings. Yes, at Wealth Words, you win real money on answering the puzzles right. How freaking awesome is that! So, you see, the history of crosswords might be 100 years old but, even today, it is as new as ever with, of course a twist. The way Wealth Words has revamped and transformed the crosswords is really commendable. It indeed has paved avenue for a new era of crosswords where you cannot only play it at your fingertips but, even make money out of it. Could it get any better? Certainly not! Hence, wouldn’t it be great if you could laugh all the way to bank with Wealth Words too? After all, the cash prizes at this online crossword is as high as a whopping $1600. Yes, it ain’t any day dream. You can actually win such huge cash prizes here. All you need to do is register at its website, buy a token worth $2 for playing its game or a whole token package for playing more of it and get going. That’s about it. Grasp the clues that come your way, get the puzzles right, submit it in an active time frame of an hour (that’s important!) and see, how you win all of its divisional prizes. Yes, winning here doesn’t require any rocket science. Just be a little focused, answer its 20 puzzles correctly and you are good to win division 1 cash prizes. Moreover, Wealth Words also has division 2 cash prizes for the player who solves the next highest correct puzzles. Further, Wealth Words comes with a plethora of other short and active puzzle games too, ranging between 2 to 20 words with bigger and better pool of cash prizes. 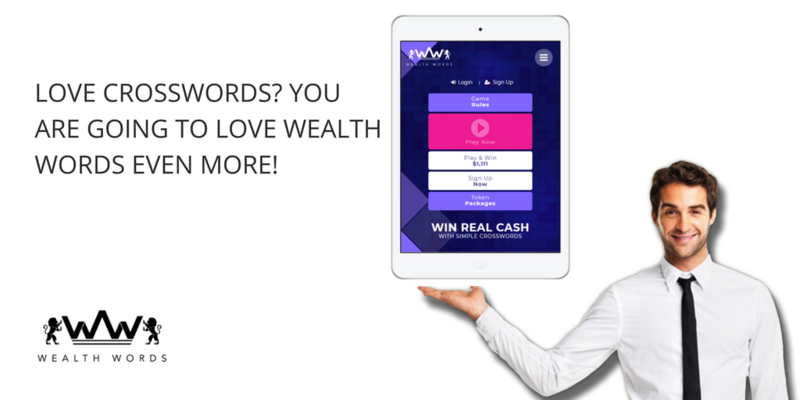 Yes, Wealth Words literally has cash prizes waiting for you to unleash anytime, anywhere. So, isn’t it high time you bring out your inner wordsmith and play a game or two of Wealth Words? Take my words, you definitely are going to have a gala time indulging in its crossword session, while of course being happy and gratified with all those cash prizes you take home!